Lifelike LEGO Animals Find a Home at The Bronx Zoo! It’s always exciting when a zoo welcomes new members to its animal kingdom, and this month, New York City’s Bronx Zoo announced more than a half a dozen new creatures! Even though they’re placed in their natural habitats next to their friends, these new animals might look a bit different — because they are made entirely from LEGOs! Created by the LEGO Master Builders specially for the Bronx Zoo, the lifelike LEGO replicas are part of a fun installation called the Great Summer Zoofari. From a tiger ready to pounce off the grass to a flock of flamingos standing in water, the creatures are sure to bring out your inner child. Hit the jump to see for yourself! It's always exciting when a zoo welcomes new members to its animal kingdom, and this month, New York City's Bronx Zoo announced more than a half a dozen new creatures! Even though they're placed in their natural habitats next to their friends, these new animals might look a bit different -- because they are made entirely from LEGOs! 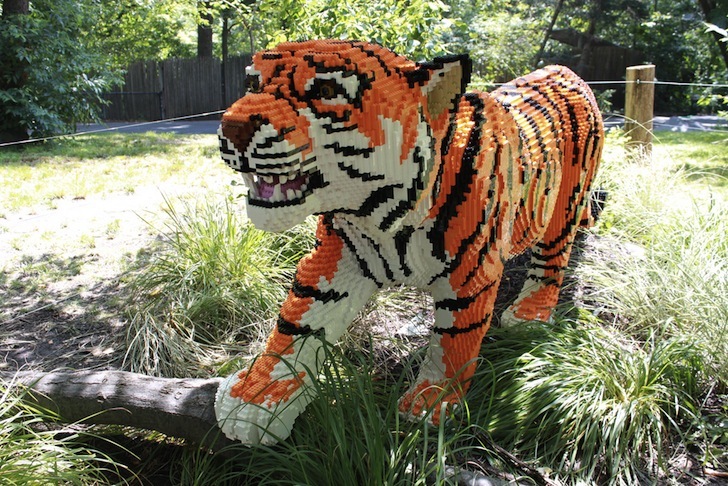 Created by the LEGO Master Builders specially for the Bronx Zoo, the lifelike LEGO replicas are part of a fun installation called the Great Summer Zoofari. From a tiger ready to pounce off the grass to a flock of flamingos standing in water, the creatures are sure to bring out your inner child. Hit the jump to see for yourself!